I wasn’t even going to blog this recipe because, really, it’s summer. No one is thinking about chili. But as I took one bite of this taco chili tonight I knew I had to whip out my camera before the sun finished setting and share this. It’s a super easy make-ahead recipe that can be tossed in the freezer until you’re ready for it and then cooked in the crock pot! I’m all about the crock pot this summer. 1) Who wants to turn on the oven during summer in Texas? And 2) I’m lazy It’s SO easy! Add in the fact that this is a prep ahead freezer meal and I’m sold. You do have to invest the time upfront to brown the meat and all that, but I enlisted my husband to help me with that one night after we put the kids to bed. It was kinda fun spending time together (ALONE) cooking in the kitchen without the pressure of two hungry ankle biters asking when dinner was going to be ready. 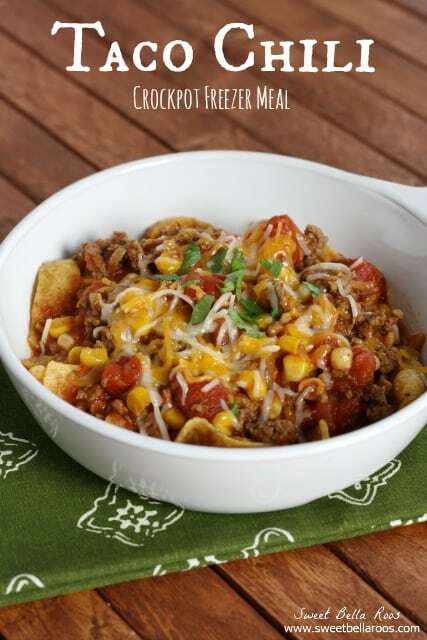 We served this with cheese over corn chips, but it would also be yummy with rice or as tacos! 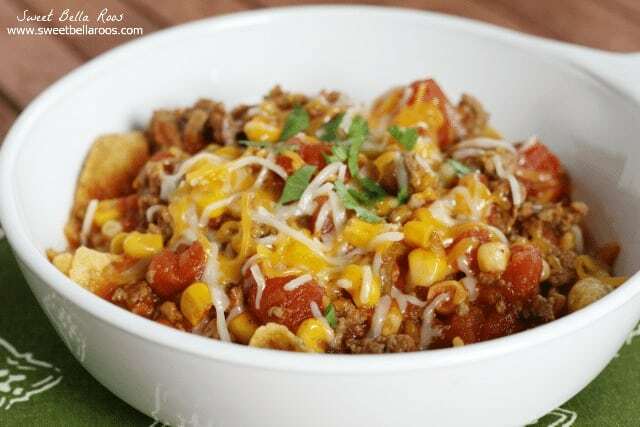 Taco Chili- super easy freezer recipe, just throw in the crockpot when ready! Place all the ingredients in a freezer bag, stir well, and freeze until ready. Place in crock pot and cook on high for one hour. Write on the bag: "Taco Chili, Cook high 1 hour, Cook low 4-6 hours"- so you don't forget! This has become a staple in our house! My husband gets so excited when it’s taco chili for dinner! And it’s SO easy; I usually cook in a double batch! Thanks for the great recipe! Does the chili have a kick to it because of the canned green chilies? I’m not sure if the kids can handle spice, so I wanted to check. My kids don’t mind it, you can omit them or use the mild chiles if you like. Hope this helps! Hi! How long will this meal last in the freezer? I noticed the instructions say to cook on high on hour and cook on low 4-6 hours. Just wanted to double check that this is correct – cook on high for 1 hour and then lower to ‘low’ for an additional 4-6 hours? Hi Jessica, congrats on the baby! Yes, I like to cook most of my slow cooker meals on high for the first hour to bring things up to temperature and then lower heat for the remainder. Since everything is fully cooked in this recipe beforehand, it’s not imperative. Hope this helps! How long do I need to cook it for if I am making it without freezing it? I usually do about 4 hours. Be sure to cook the ground beef first, and then it’s just a matter of letting the flavors meld together and heating since nothing else really needs to cook. Had this tucked away in the freezer for a busy night. Plopped it in the slow cooker today and headed out for roller hockey. The family was starving by the time they had skated for four hours, and this was ready to go! A delicious family friendly, budget friendly meal! Thank you! We all can’t wait to have it again! How many people will this serve? Please and thank you! 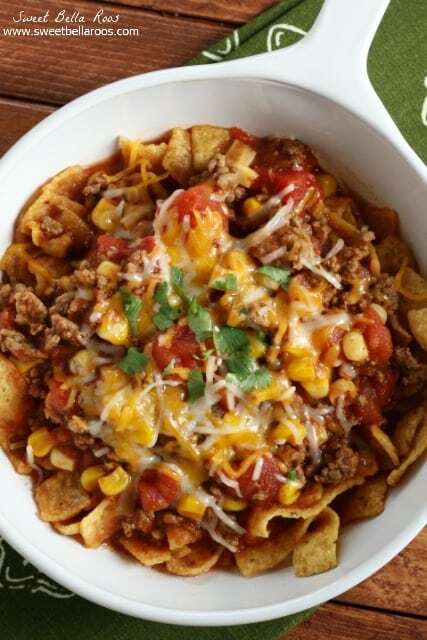 This sounds amazing I would like to make this today!! Could I put my hamburger in raw and cook it on low for the whole day? Hi Cherise, I wouldn’t. If you don’t cook it and drain it first the end results may be greasy. does the meat need to be cooked before freezing? wouldn’t it be really dry after cooking again in the crock pot? Hi Kristin, yes be sure to cook the meat. It won’t be dry because of all of the other wet ingredients. It really won’t cook again, it just warms up from being frozen. When my husband eats chili, he basically turns it into a taco lol He would love this recipe! Thanks for linking up with Delicious Dishes Link Party! I don’t care what time of year it is, I love anything chili and taco/tex-mex flavored! This sounds like a great set-it-and-forget-it meal! Thanks for linking up with Merry Monday! Oh, this looks so, so delicious! I need to try it asap – we love chili around here! No, that is for the whole batch. Sorry about that! I love it that you don’t use seasoning packets. I have to watch the sodium with my husband. Do you thaw this first or put it in the slow cooker frozen? 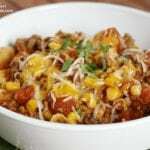 I was just thinking about how I haven’t used my crockpot enough this summer, this recipe looks perfect! I love the corn chips! Give me a slow cooker meal any day! I host Tickle My Tastebuds Tuesday and would love it if you would come over and share this recipe. I’m sure our party goers would love it! Here is the link http://bit.ly/1mF7z6K. Have a wonderful day!! Great flavors and love that you can make it ahead of time !